I'm in love with gel cleansers this year! Early last year I tried my first ever gel cleanser and it didn't go well. It kind of put me off gel cleansers for a while. However, when Cosrx came out with their gel cleanser last year and everyone was raving about it, I was curious. So I made a purchase to try it and that was the best decision ever because that gel cleanser is the bomb. It made me wonder, what other awesome gel cleansers am I possibly missing out on. Fast forward to present time, I've been testing out this Nooni Advanced Repair Therapy Super Revitalizing Gel Cleanser for over a month. (Man, what a long name.) Nooni is an in house brand of Memebox and my mom and I have tried a few products from them. They are generally a skincare brand offering products from cleansers to toner, creams and more. I tested out the Nooni Gel Cleanser because I wanted to know how comparable this cleanser is to the Cosrx Gel Cleanser. Let's find out! 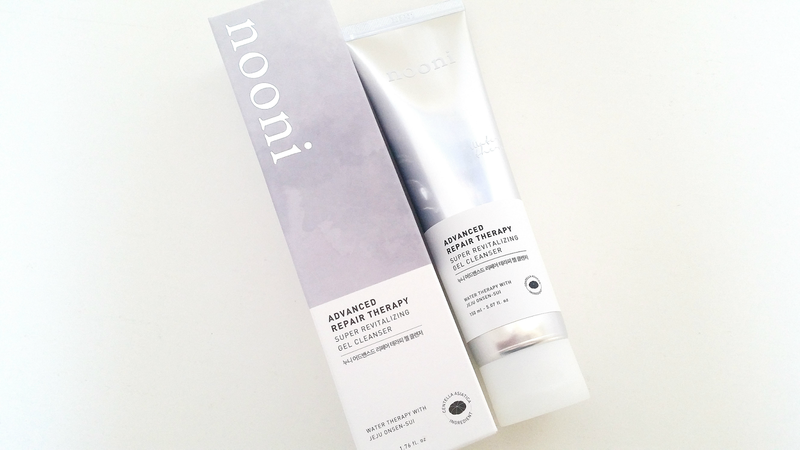 Product Description: The Nooni Advanced Repair Therapy Super Revitalizing Gel Cleanser is a soothing and refreshing gel cleanser. It has a pH of 6, making it a gentle cleanser that's also good for sensitive skin. The cleanser is enriched with Centella Asiatica extract, aloe extract, witch hazel, and more to calm the skin and relieve it of irritations and redness. This gel cleanser is also formulated with carbonated water for Jeju, which can provide a deeper cleanse while nourishing the skin. Together with the other natural botanical extracts like Bergamot and Matricaria, this cleanser can help to strengthen layers, remove excess sebum, improve overall skin complexion, and prepare the skin for the rest of the skincare routine. To Use: Wet the face with water. 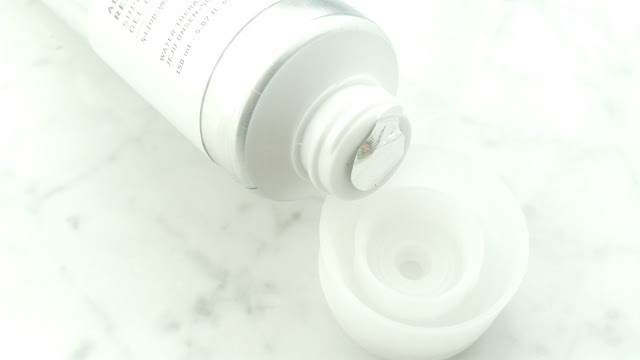 Squeeze out a dime size amount of cleanser and apply it to the face. Massage in circular motions for 15 to 20 seconds, then rinse off. (This cleanser can be used as the second step of a double cleanse routine.) Tip: For a deeper cleanse, use this Nooni Gel Cleanser with a silicon pad. Expiration date can be found at the bottom of the package. Ingredients: Centella Asiatica Extract, PEG-7 Glyceryl Cocoate, Glycerin, Butylene Glycol, Dipropylene Glycol, Carbomer, PEG-60 Hydrogenated Castor Oil, Tromethamine, Simmondsia Chinensis (Jojoba) Seed Oil, Carrageenan, Phenoxyethanol, Chlorphenesin, Xanthan Gum, Fragrance, Ethylhexylglycerin, Caprylyl Glycol, Disodium EDTA, Citrus Aurantium Dulcis (Orange) Oil, Citrus Medica Limonum (Lemon) Fruit Oil, Citrus Grandis (Grapefruit) Peel Oil, Lavandula Angustifolia (Lavender) Oil, Geranium Maculatum Oil, Citrus Aurantium Bergamia (Bergamot) Fruit Oil, Santalum Album (Sandalwood) Oil, Rose Flower Oil, Chamomilla Recutita (Matricaria) Flower Oil, Salicylic Acid, Aloe Barbadensis Leaf Extract, Onsen-sui,Hamamelis Virginiana (Witch Hazel) Leaf Extract, Houttuynia Cordata Extract, Water, Styrax Benzoin Gum, Glycyrrhiza Glabra (Licorice) Root Extract, Commiphora Myrrha Oil, 1,2-Hexanediol. This gel cleanser contains a couple of ingredients that can be potential acne triggers or irritants. Most notably is Carrageenan, which has a potential acne trigger rank of 5 and a potential irritant rank of 2. 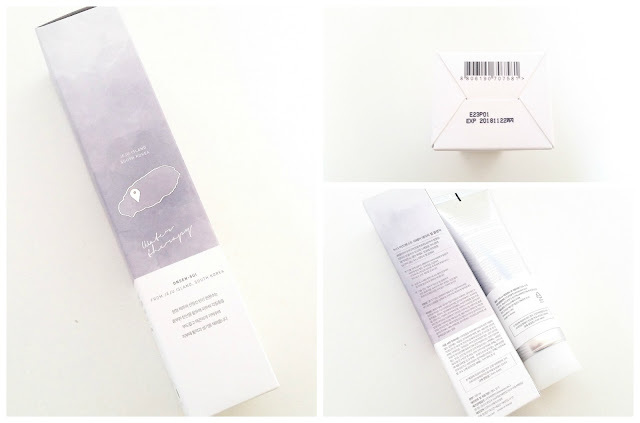 Packaging: Like the facial cream from the same line, this Nooni Advanced Repair Therapy Super Revitalizing Gel Cleanser has a simple packaging. Its colors are black, white, and silver, making it look nice and sleek. This cleanser is quite large. With 150ml of product it's sure to last for a long time. The cleanser's packaging comes with plenty of information in both English and Korean as well. This Gel Cleanser is stored in a squeeze tube. It's pretty easy to use. It comes with a silver protective seal, as you can see in the image below. 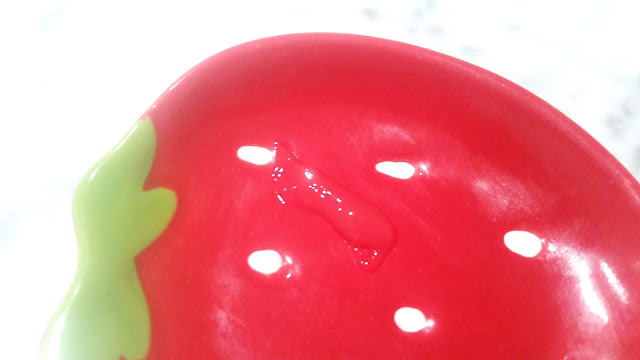 Scent: Although fragrance has been added to this gel cleanser, personally I don't mind it. In fact, I really like the scent. It's refreshing, light and sweet. I find this scent better than the Cosrx cleanser. While the Cosrx cleanser doesn't have added fragrance, its natural herbal scent is bit strong and it takes time to get use to it. However, this Nooni cleanser's scent was a refreshing change and I definitely like it. Color: The gel cleanser is colorless but a tiny bit opaque. Texture: Well, it's gel like hence its gel name. Once you add water to it, it bubbles a super tiny bit but not as much of you would get from a foam cleanser. As comparison, the Cosrx gel cleanser bubbles a whole lot more than the Nooni gel cleanser. Michelle's Thoughts: I set out to see how this Nooni Gel Cleanser would compare to the Cosrx Gel Cleanser and I ended up loving both. They both have their super awesome points, equally awesome points, and 1 or 2 slightly not so awesome points. Ingredient wise, Cosrx's cleanser is safer. It has less potential acne triggers and irritants, and it doesn't have any added fragrance. However, the Cosrx cleanser does smell strongly of herbal scents, so it won't be pleasing for everyone. On the other hand, while the Nooni cleanser has fragrance added to it, its scent is light, sweet, and refreshing. Both cleansers come in 150ml tubes, so you definitely get your money's worth. Gel cleansers don't all lather the same. As I've mentioned previously, the Nooni cleanser doesn't lather as much as the Cosrx cleanser, however, they both cleanses well and leaves the skin clean without stripping it. I think gel cleansers are great for those who have sensitive skin like myself. They are really gentle yet they still cleanse effectively. 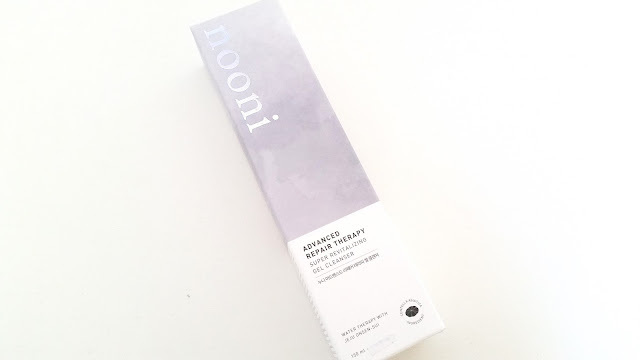 Like Cosrx, the Nooni cleanser is great for sensitive skin types. They both have about a pH of 6 and both contains natural ingredients to help reduce irritations while it deeply cleanses. My skin feels great after I cleanse with this cleaner. It's not stripping yet it manages to calm my sensitive skin, reduce redness, control excess sebum, and get it ready for the rest of my skincare products. After over a month's use, I feel like it's helped with my skin complexion too. While I do use other products to lighten my post acne marks (those red spots left by acne), I feel like the cleanser added some help too. Plus, the light and refreshing scent is really calming as well and adds to the overall feel of the product. I think this cleanser would be a great alternative for those who can't stand Cosrx's strong herbal scent. Final Thoughts: I am really pleased with this cleanser and I love it! It's gentle yet effective and the pleasant sweet scent adds a soothing touch to it. My skin feels great after each use and I love that it helps to reduce redness and irritations. Best of all is that I can use this cleanser when my skin is super duper sensitive too. So this Nooni Advanced Repair Therapy Super Revitalizing Gel Cleanser definitely claimed a spot in my emergency skincare routine. Would I purchase it in the future? Yes I would! I think this one tube will last a long long time, but when the time comes, I would buy it. Especially since it's got a spot in my emergency skincare routine, I'm sure to always have 1 on hand. Do I think this cleanser is worth a try? Most definitely! This cleansers is worth a try for those with sensitive skin types or for those looking for a low pH cleanser. However, like every product, just make sure you aren't sensitive to any of its ingredients. Personally, I think this Nooni Gel Cleanser is great for those who can't use the Cosrx cleanser due to scent or other reasons. BONIPSY30: get 30% off Nooni and Bonvivant products at Memebox. Offer valid until 9/30/2016. Disclaimer: This product was send to me for review purposes. All opinions are honest and my own. This post contains some affiliate links, for more information check out the full disclaimer.